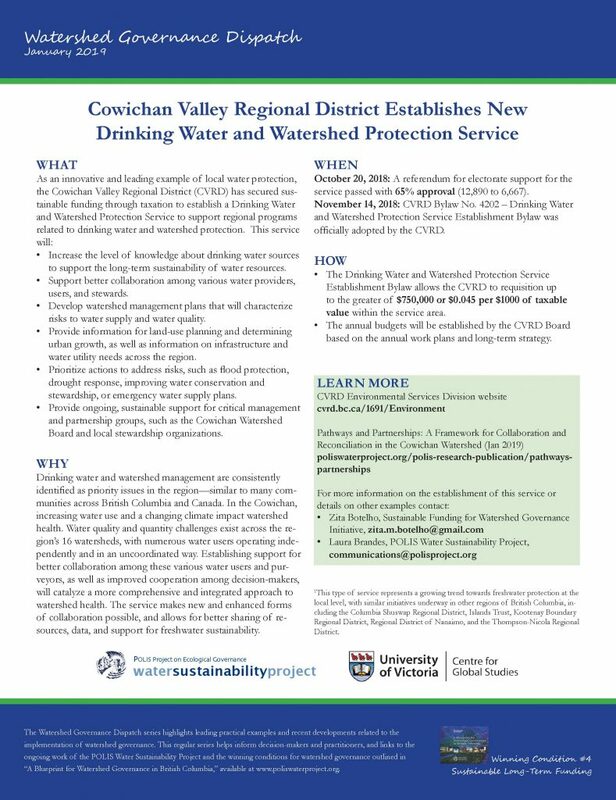 This short, focused research summary outlines the establishment of the Cowichan Valley Regional District’s Drinking Water and Watershed Protection Service. It is the first instalment in the POLIS Water Sustainability Project’s Watershed Governance Dispatch series for practitioners and decision-makers. Each Dispatch describes the what, why, when, and how of a recent or emerging innovative development in watershed governance. Each Dispatch links to the winning conditions for watershed governance outlined in A Blueprint for Watershed Governance in British Columbia (January 2014). This Dispatch relates specifically to the winning condition of sustainable long-term funding.